Cherry season is short lived in South Africa and as soon as I see cherries in the fridge at our local supermarket I buy them. Dave does not like cherries at all, so I can enjoy punnet after punnet without feeling guilty, and without having to share. I recently stopped off at a berry farm to buy some gooseberries and they had packets of frozen black cherries. I decided straight away that I would make ice cream with them. What a perfect way to indulge in my cherry needs anytime of the year and without having to share! 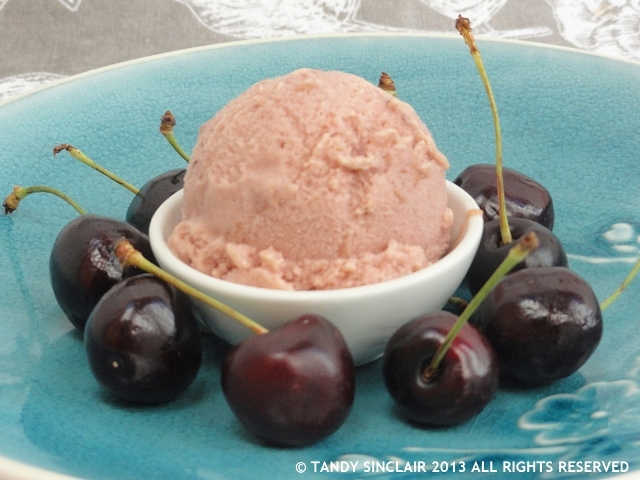 Do not be limited by cherries here, you can use any non acidic fruit to make this ice cream. I do not mind texture in my ice cream so I did not pass the cherry custard through a sieve, however, I would recommend you do so in order to get the nice smooth creaminess one expects from an ice cream. You can even add some cherry liqueur to this for some extra oomph if you are not sharing your ice cream with children. Dave ventured out of his comfort zone and tried some of the cherry ice cream, more so because it was really hot rather than because he wanted to. He did not mind the cherry flavour which meant in the end, I had to share my ice cream with him. do you eat something your partner doesn’t? Don't throw out your egg whites. You can safely freeze them and I write on the freezer bag how many egg whites are in there. Egg whites can be brought back to a usable state by defrosting in the fridge. They will whip up much better after being frozen for some strange reason. This sounds lovely. I haven’t used my ice-cream maker for ages but will have to get it out soon if summer comes! I remember having black cherry ice cream in spain when I was younger and it was always so so good. Oh yum! I’ve never tried black cherry ice cream before. I just want to reach in with a spoon! It’s already warm, not hot, but each weather is good for a homemade ice creams. Drool Tandy! That looks great!! Unfortunately cherry season is over here in Australia. Do you think I could use canned Morello cherries in syrup for this recipe? Perfect – it will almost be cherry season soon in Spain so I will be making this! All your ice cream recipes tempt me so much. Oh-oh! Is ice cream season again, I need an ice cream machine ASAP! 😉 I love cherry ice cream! I think you should invest in one, your kids will love you for it! That looks delicious. I can’t think of a single thing that my husband doesn’t enjoy but I’m definitely more of a veg and salad eater than he is. What a lovely recipe. I remember the time I first tasted cherry ice cream! Dave made me laugh – sounds like when I acquired a taste for Lychees – suddenly my Dads treat was fair game! I should try a lychee ice cream! How was your time with your dad? I shall have to look out for that flavour! Look at that list of beautiful ingredients so pure and lovely, just like your icecream. I am so going to get on the make your own icecream machine bandwagon. My kids would love me. I want to experiment with some lactose free recipes soon!